I am very proud to let you all in on some exciting news: my upcoming cookbook Perfectly Creamy Frozen Yogurt: 56 Amazing Flavors plus Recipes for Pies, Cakes & Other Frozen Desserts is available for pre-order! This may not be quite such a news flash to those of you following Baking Bites on Facebook or on Instagram, as I’ve mentioned it more than a few times on those channels, but if you didn’t know yet – you do now! 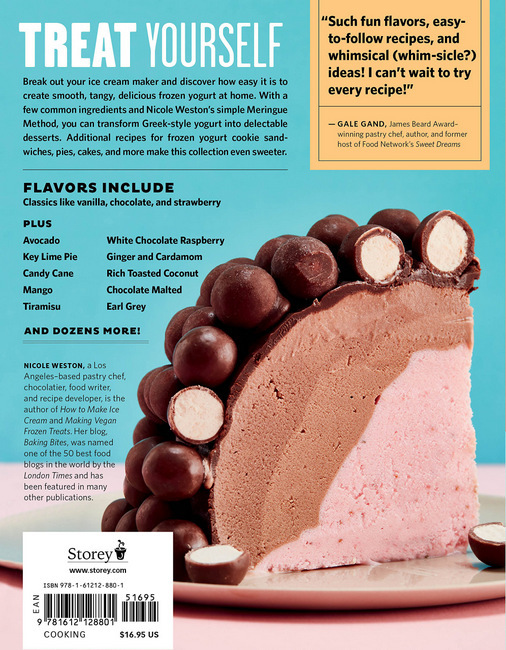 Almost four years ago, a book called How to Make Frozen Yogurt was published as part of a series of books I wrote on how to make a variety of frozen desserts. The other two books in the series were How to Make Ice Cream and Making Vegan Frozen Treats. It offered readers a nice introduction to making frozen yogurt, but when I had the opportunity to more than double the size of the book and add in chapters about making a variety of frozen yogurt desserts, I jumped at it. 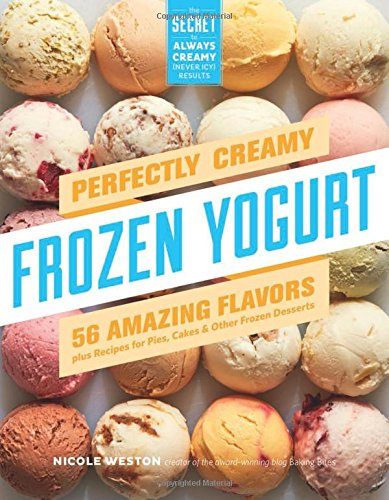 This book walks you through everything you need to know about making frozen yogurt at home – from making your own yogurt from scratch (not a requirement, but tasty!) to creating frozen yogurt pies that are better than most ice cream cakes. Eating the homemade frozen yogurt after trying one of my recipes is the best part, however the book is gorgeous to look at and filled with mouthwatering photos of all the recipes. It is due to be released on May 29 2018 and I encourage you to get your preorders in early because many retailers discount their prices before the book is released. I’m including some handy links here, but you can certainly request a copy from your favorite local (or online) retailer if I haven’t linked to them here! Stay tuned to my social channels for some sneak peeks of the book (and maybe a bonus recipe or two!!). You can also check out my Amazon author page for a handy list of all of my other cookbooks.